Soak 8 (10-inch) wooden skewers in water 30 minutes. Heat gas or charcoal grill. Place 1/2 cup peanut sauce in medium bowl; set aside. Cut chicken crosswise into 1/2-inch thick slices. Thoroughly coat chicken slices with sauce in bowl; sprinkle with 1/4 teaspoon salt. Cover and refrigerate 30 minutes. In another medium bowl, stir together cucumber salad ingredients; set aside. 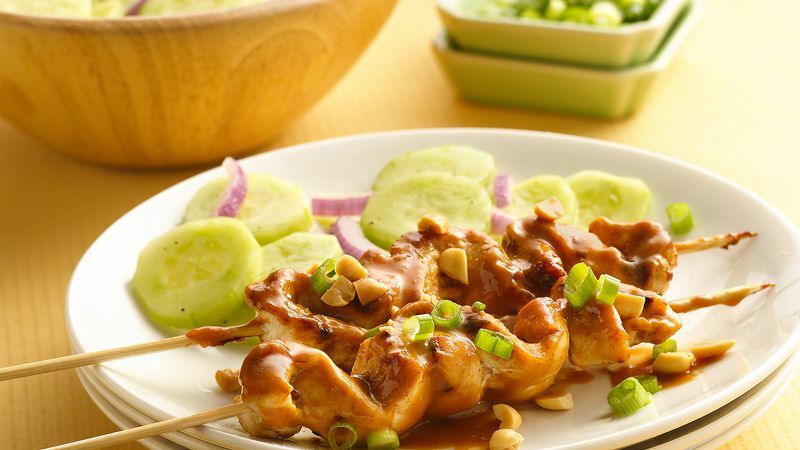 Remove chicken from bowl; discard peanut sauce. On each skewer, thread 4 to 5 chicken slices. Place skewers on grill over medium heat. Cover grill; cook 6 to 8 minutes, turning once, until chicken is no longer pink in center. To serve, divide cucumber salad among 4 serving plates. Top with chicken skewers and toppings. Peanut sauces can be spicy. Check out the ingredients on the label before buying to get an idea of how hot the sauce is. When placing chicken on skewers, keep the skewers centered in the chicken slices as much as possible so the slices have less exposure to the grill surface to avoid burning.